Number 5 Gully on Ben Nevis. Mathieu Biselx, 30, was climbing in an area known as the Number 5 Gully with his three friends Raphael Aymon, Cedric Ravimet and Adrien Robez-Masson when the deadly avalanche swept them off their feet. In an online tribute, showcasing a picture of the group in happier times, the Lochaber team said: “A lovely picture of the boys… their love for the mountains and climbing clearly written on their faces. Mr Biselx from Switzerland was the sole survivor of the ordeal and remains in a stable condition at Glasgow’s Queen Elizabeth University Hospital. Rescuers first received reports of the tragic incident in the area around 11.50am. 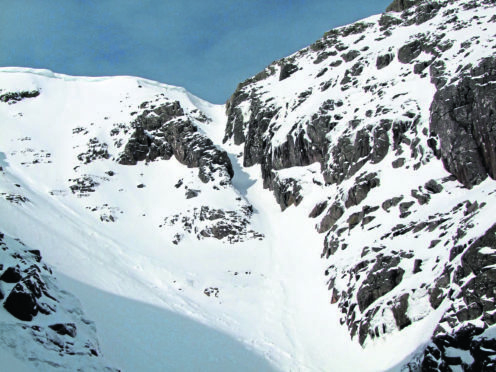 The team, alongside 16 members of Glencoe Mountain Rescue Team and more than 29 volunteer mountain rescuers who happened to be training in the area, raced to the scene. Paul Boggis from Mountain Magic commended the team for their brave work. He said: “So much love going out to Mathieu and his friends’ loved ones.